On today’s docket in London, Group B leader Roger Federer will take on David Ferrer, and Juan Martin del Potro will try to earn his first World Tour Finals win against Janko Tipsarevic. I’ll be liveblogging all the action right here! 2:09pm – Federer immediately goes down 0-40 in his first service game, and manages to hold by winning five straight points. He did it on purpose just to break Daveeeds little heart and spirit. 2:15pm – Ferrer double-faults at 30-all in his first service game to give Federer break point. Federer converts it for 2-0. 2:28pm – Federer’s first serve completely deserts him, but it doesn’t matter. After a couple chances for Ferrer, Federer holds for 3-0. 2:31pm – Ferrer gets on the board for 1-3. Federer may want to work on that first serve %. He’s 3/18 so far on first serves. 2:35pm – Federer breaks himself with a sloppy service game. Back on serve at 2-3. 2:43pm – Federer holds for 4-3 at love. One gets the feeling that if Federer’s first serve shows up to the match, he could run away with the match. Still at 39% first serves so far. 2:48pm – 20 unforced errors for Federer, just 9 winners. Ugly match so far. 2:52pm – Federer holds again for 5-4. 2:57pm – Federer plays four non-awful points on Ferrer’s serve and takes the first set. I think I’ve seen this movie before. 3:05pm – Federer fights off more break points to hold for 1-0. @amyfetherolf seriously horrible stuff from both.How lucky am I to have picked this monstrosity for my first live fed match? 3:14pm – Federer is yelling at himself in German. Still, he leads 6-4, 2-1. Hi @rafasmile!! I come back early on the court! Thanks for your support! 3:28pm – An interesting stat from ESPN3: Federer’s service games are averaging 4 minutes and 20 seconds. Ferrer’s are averaging 2:47. Ferrer has definitely made Federer work to hold serve. Still, he only has one break of serve to show for it, and that came when Federer was already up a break in the first set. Federer holds for 4-3. Ferrer doing his best to make up ground in the unforced errors race, still trails 32-17 though. you can do it David! 3:43pm – More of the same. Federer holds for 6-5. 3:48pm – Ferrer gets to a tiebreak. It’s the second tiebreak they’ve ever played against each other, the other one coming at 2006 Basel. 3:54pm – Luckily, we are spared a third set of that mess. 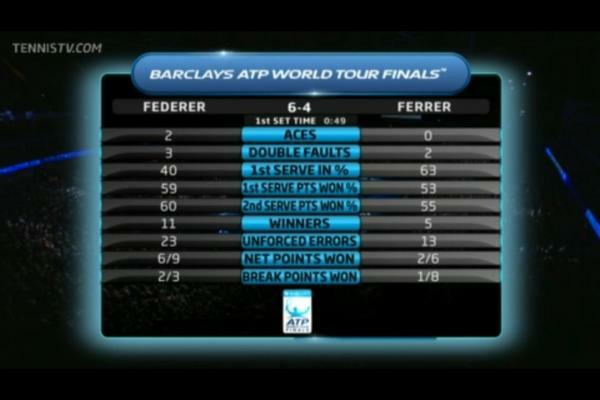 Federer d. Ferrer, 6-4, 7-6(5). Federer will advance to the semis of the World Tour Finals. He’s now 14-0 in his career against Ferrer. And a cute anecdote from Roger Rasheed. 7:46pm – I’m back! Del Potro and Tipsarevic are on-court. Del Potro fondly pats the little girl who escorts him on-court on the head. Janko onto his third racquet during the warm up. The strings broke after becoming suddenly fatigued. 8:01pm – Del Potro immediately breaks for 1-0, not having to work very hard for it. Not a great start for Tipsarevic. 8:08pm – Del Potro holds for 2-0, despite facing a break point. 8:12pm – Del Potro unleashes the forehand. When you hear that grunt, you fear for the player on the other side of the net. He breaks again for 3-0. 8:26pm – Tipsarevic is broken yet again. Del Potro serves out his fourth bagel of the year. His previous three: Yen-Hsun Lu at the Australian Open, Viktor Troicki in Rotterdam, and Rui Machado in Estoril. 8:37pm – There’ll be no double bagel for del Potro. Tipsarevic gets on the board for 1-0 in the second set. Crowd goes nuts at the first sign of a competitive match. @andyroddick what’s keeping u busy these days? 8:47pm – Del Potro easily holds for 2-all. 9:03pm – Tipsarevic hands over the break, and a few games later, del Potro will serve at 4-3. 9:07pm – Del Potro holds for 5-3. Over at the O2, Boris is getting even more bored now. @ochocinco that’s all u do these days? 9:15pm – Game, set, match, del Potro, 6-0, 6-4. He beats Tipsarevic in straights, staying alive for a chance at the semifinals.